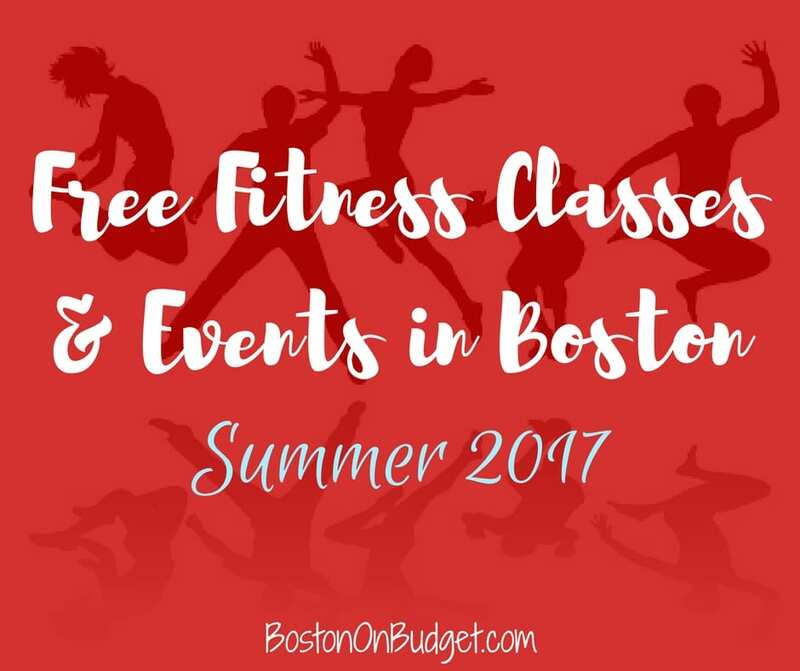 Summer is a great time to ditch the gym membership and take advantage of all the amazing FREE Fitness Opportunities in the Boston area! 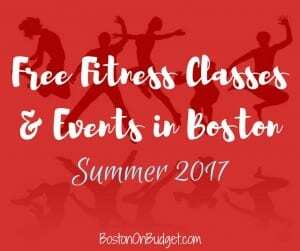 Boston Parks Summer Fitness Series: Free bootcamp, yoga, zumba, salsa dancing and much more at local Boston parks from June 3, 2017 to August 31, 2017. For the full schedule, please head here. Seaport Sweat: Free fitness classes from Boxing to Yoga on weekdays starting June 1, 2017 to September on the Seaport Common at 85 Northern Avenue. Sunrise Yoga Series: Free outdoor Yoga Series at the Charles River Bistro on Saturdays at 8AM until June 22, 2017. FIT on the Garden: Free fitness every Wednesday from 6-7pm from June 7, 2017 to August 30, 2017 on South Garden at the Prudential Center! Summer Yoga at Frog Pond: Free yoga classes on the lawn adjacent to the Frog Pond Carousel at 6:00pm every Thursday night this summer from June 8, 2017 to August 31, 2017. Please bring your own mat and blocks if you can. Yoga in the Park: Free yoga classes at Assembly Row in Somerville from May to September on Saturdays at 9am at Baxter Riverfront Park. Registration is required, and bring your own mat. Rain location: 521 Assembly Row. MSL Pilates Summer Bootcamp: Free (Suggested donation of $5) MSL Pilates Summer Bootcamp twice a month on Monday nights at 6:30pm in June, July and August. Please RSVP and bring your own mat. Free Salsa in the Park: Enjoy free salsa dancing this summer at the Blackstone Community Center (50 West Brookline Street) starting June 12, 2017 to August 28, 2017 from 6-9pm with a special salsa training for volunteers on June 5, 2017. Summertime at the Street: Free Yoga on Sundays at 9:30am, Free Kick it By Eliza Fitness class every Tuesday at 7pm, Free Barre on Wednesdays and Saturdays at 10am and a Free Body Blast class on select Wednesdays and Sundays at 10am at The Street in Chestnut Hill. Registration is encouraged. Norman B. Leventhal Park: Free yoga, bootcamp, barre, and more offered Mondays-Fridays at Post Office Square starting June 26, 2017. For the full schedule, please click here. BOXFIIT on the Harbor: Free fitness class every Monday night from 5:30-6:30PM on Waterfront Plaza from July 10, 2017 to August 28, 2017. Free Zumba: Tuesdays at 6pm at the Hatch Shell. Run Club: Wednesdays at 6:30pm at 671 Boylston Street (Marathon Sports). Bootcamp: Thursdays at 6pm at Fielder Field. Donation Yoga: Branching Out Yoga offers donation yoga the first and third Sunday of the month starting June 4, 2017 at Arnold Arboretum (near Dawson Pond) from 9-10am. Yoga in the Park: Free all-levels yoga on Sunday mornings from 8-9AM in the Minot Rose Garden at Browne & St. Paul Streets in Brookline from July 9, 2017 to August 27, 2017. Troops for Fitness: Free fitness classes across Boston lead by former military personnel held often across Boston. Current schedule. Marathon Sports Run Group: Marathon Sports sponsors a run group every Wednesday night at 6:30pm which meets at their Boston, Brookline, Cambridge, and Wellesley store locations as well as other days/times for their other store locations. lululemon athletica Run Club: Free run club every Monday at 6pm in store. Keep in mind that the majority of classes, if not all, are outside and some may cancel due to rain so make sure to do your own due-diligence before heading out to a free class. You may also need to register for some classes before heading out or bring a yoga mat (affiliate link) with you. Just make sure to head to the event’s website before heading to make sure you have everything covered. Please let me know in the comments below if I missed any free fitness programs or classes this summer in Boston. Thanks! Hope you found this post helpful!